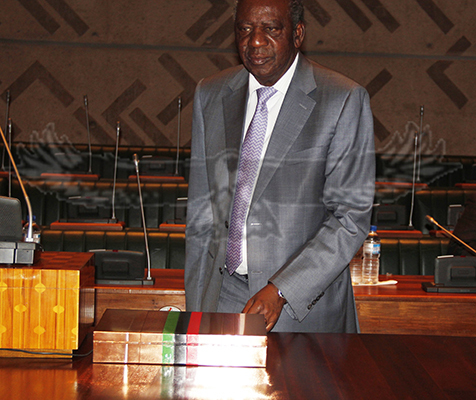 Finance minster Chikwanda looking confused and alone with the budget last year. A Catholic Priest has warned that the national budget to be presented to parliament this Friday by Finance minister Alexander Chikwanda shall be useless if it does not address poverty. Kabwe’s Sacred Heart Cathedral Adminisrator Father Peter Tembo said the national budget should not be about technicalities and philosophies but address hunger and poverty that has rocked the nation under the PF regime. Father Tembo was speaking to local media ahead of the 2014/2015 national budget to be presented in parliament this Friday. It is however not very clear under what theme and what items the government wants to incorporate in the budget. “This year’s budget should address the real suffering of the people. If it is all about technicalities and philosphising then it shall be useless altogether,” said the priest. Meanwhile UPND central province youth chairman has reiterated his party’s position to award bursaries to university students. Mwanakampwe has condemned the PF government’s decision to reduce the number of beneficiaries while the same government had money for by elections. The youth leader said the ill decision was just reflective of the PF government’s poor administrative skills because they were unable to understand which sectors of the economy were important, and to them education was not necessary.